The big day has arrived. Last night I enjoyed a big roast dinner and a glass of wine as my last supper! A meal like that isn’t going to fit in my 600 kcal dinner allowance. I’m going to be brave and admit that this morning I stepped on the scales and I weighed 13st 9 lbs which makes my BMI 29.9. 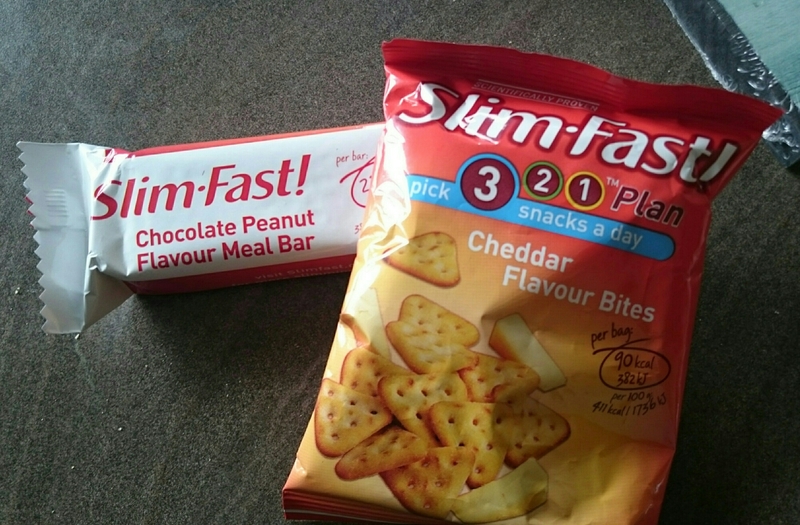 Not fantastic by any means but that’s the reason I wanted to give Slim Fast a go. This mornings breakfast was a bit different from the normal toast and marmite. I had a banana shake about 9.30 and made sure I planned a busy morning of baby clinic and visiting my parents to take my mind off any hunger. I picked banana this morning as I’m not a huge fan of banana milkshake and wanted to get it out the way but I really enjoyed it. I expected them to taste a bit powdery but it was just like any normal banana milkshake. I downed it in secret so the kids didn’t try to steal any and flew out the door. Having a shake for breakfast is an awful lot more convenient than my usual breakfast choice. We had lunch at about 1ish as we’d been out all morning. I’d packed one of my snacks to have during the morning but was too busy so I added them onto my lunch. Lunch consisted of a bag of cheese bites and a chocolate peanut meal replacement bar. The crisps had plenty of cheese flavour and were lovely and crunchy. They certainly made up for not having my lunchtime bag of crisps. The meal bar had plenty of chocolate on it which sorted out my lunchtime sugar hit and certainly gave my jaw a workout with how chewy it was. It tasted great. I had a snack mid afternoon of barbecue flavour tortilla crisps. They had plenty of flavouring and were certainly a great afternoon pick me up. Unfortunately the kids spotted me having these and wanted to try them. They enjoyed they as they came back for seconds! I was really looking forward to dinner. I struggled cooking the kids dinner as it was making me so hungry. I literally ran down the stairs and did the quickest dinner we had in the house. Dinner consisted of a tuna steak, asparagus, cous cous and leftover barbecue corn on the cob coming in at just under 600 kcal. I saved my final snack of the day for after dinner as I always like to have something sweet. I swapped a Slim Fast snack for a Muller Light yoghurt. Anything counts as a snack as long as it’s under 100 kcal. I took the twins to baby clinic so walked just over a mile and a half with the pushchair.